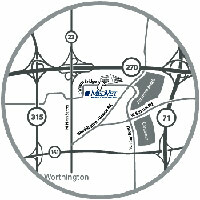 MedVet Medical Center for Pets reported Dec. 24 that it is building a cancer center on its Worthington, Ohio, campus. MedVet Cancer Center for Pets, scheduled to open early 2009, will offer expanded surgical, medical and radiation oncology services. It will also feature an open waiting area with comfortable seating and a patio overlooking Paws Park, what the hospital says is the perfect place for clients to focus on their pets and share experiences with other cancer center clients.